War is an exploration of how masculinity constructs and whiteness through a reimagining of the card game War. Using faux-rituals around a deck of “male-socialization” cards, Eli and a volunteer will play until the game is won. In their Risk/Reward debut, Eli asks the audience to consider what winning really means; how far are they willing to go to finish the game? Eli will ask the audience for a volunteer to come on stage to play a game of “War.” They will explain that we are going to play with a special deck, “a deck dedicated to teach boys to be men.” Eli will describe the rules of the game: each player will start with half the deck; every round each player will flip over one card and read what is written on it out loud; then the volunteer will decide which card wins; this will be repeated until one player has all the cards and wins the war. 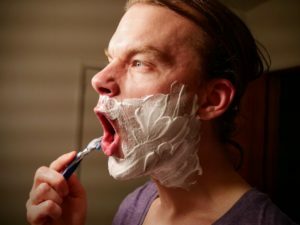 The point of this game is to explore how we understand the interaction of different aspects of male socialization and the underlying structures that create and reinforce our personal experiences, while also examining how white-supremacy and racism are integrally intertwined with dominant notions of maleness. How has the audience experienced and perpetuated male-socialization (either as people taught to be men and/or people subjected to male dominance), and how do racism and sexism feed each other? Eli Steffen is a Seattle-based artist whose work focuses on the intersections of community, culture, and identity. Eli seeks to understand what binds us together and how that relates to personal representation, violence, and belonging. Most recently Eli has performed with Syniva Whitney/Gender Tender, the A.O. Movement Collect, Future Husband, and Vanessa Dewolf. Eli is a founding member of Future Husband, an international performance collective. Eli’s work has been shown at Dixon Place, The Martha Graham Studio, Richard Hugo House, Seattle City Hall and the Museum of History and Industry. Corinne Manning (performer) is a prose writer, literary organizer and performer whose fiction has appeared in Story Quarterly, Calyx, Vol 1 Brooklyn,Moss, The Bellingham Review,Southern Humanities Review, and is forthcoming in Wildness from Platypus Press. Additional stories and essays have appeared in Literary Hub, Vol 1 Brooklyn,Drunken Boat, Arts & Letters, anthologized in Shadow Map: An anthology of Survivors of Sexual Assault (CCM Press), and recognized as notable in The Best American Series. Corinne has received grants and fellowships from 4 Culture, Artist Trust, and the MacDowell Colony and founded The James Franco Review, a project on visibility and reimagining the publishing process. 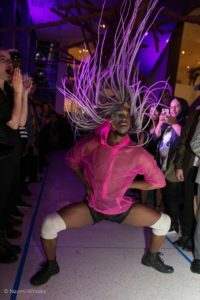 In her Risk/Reward Festival debut, Bouton Volonté brings us Planet Pink, a playful dance piece delving into her own private imagination/thought-space; a visual diary entry from a black queer bald femme. Planet Pink takes the audience on a real and personal journey of self-love and transness. Bouton, often perceived as a black man but identifying as a non-binary femme, challenges beauty standards by trying things that are typically only acceptable from cis women (think: flowy night gowns, bras & wigs, etc.). Bouton Volonté teaches a local dance class called CUUNTEMOORARY (modern dance/vogue fusion) and belongs to vogue group House of Flora. A film student at Portland State University, Bouton performs very often in local drag and burlesque shows here and also in the Bay Area. You will also see her in variety shows and festivals, where she is able to dance more than one style and be more creatively expansive. 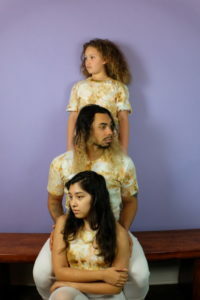 Featuring vignettes on mixed-race experience, Moonyeka and her team of Seattle-based dancers and designers bring their show, In the White Frame, which has previously existed as a live installation but will be transformed into a performance on stage for the Portland premiere of this work. In the White Frame explores the multi-racial experience in “post-racial” America. Read on! Featuring dancers El Nyberg, Michael O’Neal Jr., Alyza DelPan-Monley, Bria Calhougn-Anderson, and Estrella Gonzalez. Ravella Riffenburg: Light Design + Nic Masangkay: Sound Design. Angel Alviar-Langley (aka Moonyeka) is a sick and disabled queer Filipinx femme street-styles dancer who utilizes art creation and organizing to realize a more inclusive and intersectional world for the communities she comes from. Her current projects for 2018 include expanding WHAT’S POPPIN’ LADIEZ?! into a mentorship program for young brown femmes of color, and so much more! Moonyeka is also a choreographer and dancer of Au Collective – a dance collective that puts women, queer folks, and POC at the forefront. When not battling, Angel is a teaching artist for Arts Corps + Spectrum Dance Theater, helps runs an open dance session (VIBE) for immigrant youth at Yesler Terrace, and coaches LIL BROWN GIRLS CLUB. As a team member of Moksha, a Seattle art space and local boutique owned by Karleen Ilagan and Robin Guilfoil, Moonyeka expands her artistry outside of dance by supporting Moksha’s mission to foster the next generation of Seattle artists through event curation and creative direction. Moonyeka is a DANCE CRUSH selected by Seattle Dances, the 2017 Tina La Padula Fellowship recipient, Ubunye Project 2017 contributor, Mary Gates Leadership awardee and George Newsome Humanitarian scholar.